Before learning how to conjugate basic verbs, you need to know what the subject pronouns are. Here they are listed below. The same format will be used throughout the site. "On" is used in the spoken French as a substitute for "we" especially in casual conversation. It can also represent the word "one" in English (as in: "One must be careful to...). This is especially true in the written format. If you are uncertain if the "they" you are referring to is masculine or not, use masculine as a default. You should only use"elles" if you are certain that all parties included in the "they" are feminine. The classic example is: If there are 100 girls and 1 pig (pig is a masculine word) then you must use "ils." I know, it's a bit of a sexist language. The two main verbs that form the foundation of the French language are être and avoir. You can not do much in French if you do not know these two verbs. Below, they have been conjugated in the Present Tense. The next two most used verbs in French are "Aller" and "Faire". They are conjugated below. The four verbs conjugated above are all irregular verbs. The majority of verbs in French are actually called "ER" verbs. I have conjugated a few in the present tense here below to illustrate how they work. Fortunately, once you recognize how many verbs are indeed "ER" verbs, you can say quite a bit. Remeber, the "e" in "je" is dropped and "je aime" becomes "j'aime" and is pronounced as one word. This is also true for the verbs "écouter" and "étudier." Normally the "e" in "ER" verbs is dropped when conjugated with "nous" however, in the case of the verb "manger" the "e" stays put in order to maintain the soft "g."
Try this game to see how you are progressing with things learned so far. There are more verbs out there of course, and they don't follow the ER pattern much. This is why the present tense can be so hugely frustrating for students. Below is yet another table of verbs only these end in IRor RE. There are patterns there if you look carefully. These are considered "regular" verbs, which means they more or less follow the rules. When IR and RE verbs are conjugated with "je" or "tu" they usually end in "s". When conjugated with "il" or "elle" they usually end in "t" unless if they already have a "d" on the end of the verb. Before the "t" and "d" became silent letters in French (and we're talking way back here) you can imagine that a "d" followed by a "t" made little sense sound-wise. 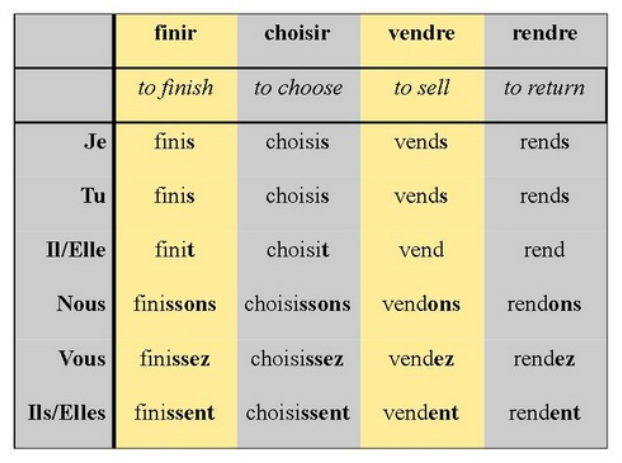 The "t" was therefore dropped when conjugating verbs like "vendre" with "il" or "elle"
This is the last group of verbs to look at. I promise. These are the irregular IR, RE and OIR verbs. There are patterns here too so look carefully. Notice how "nous" and "vous" often break from the pattern. The "s" that is usually found on the end of verbs conjugated with "je" or "tu" may be an "x" as with the verbs "vouloir" and "pouvoir". It is likely that historically the "s" and the "x" sounded very much the same. The pronouns "nous" and "vous" not only have different vowels but also a new consonant that shows up for the first time in the verb. "Ils" and "elles" are then a combination of the vowels found in the first three parts of the verb and the consonant from the "nous" and "vous" seciton.